At Xtreme Garage™ we did not invent the garage door opener, we perfected it. Simple, reliable design; heavy-duty, high-quality components; and easy installation are what make Xtreme Garage™ garage door openers great. A garage door opener is something you depend on every day. For this reason, Xtreme Garage™ garage door openers have been engineered to operate in all temperatures, from hot summers to extreme winter conditions. 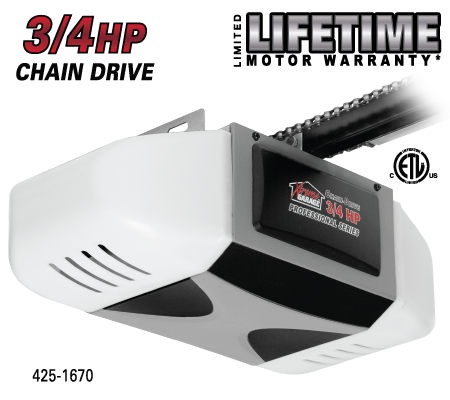 The Xtreme Garage™ Professional Series 3/4 horsepower chain drive garage door opener features an upgraded ultra-quiet motor and simple push-button programming for quick and easy set up. This garage door opener is designed to handle most sectional garage doors up to seven feet tall and 18 feet wide. This unit comes complete with an opener, accessories, installation hardware, and an easy-to-follow owner's manual. Powerful, 3/4 HP dc motor with heavy-duty chain drive system. Reduces wear & increases operating performance, even in low temperatures. Install the opener. Follow the enclosed installation instructions to easily assemble and install your opener, optical safety sensors and wall panel. Program the opener. Use the push buttons on the opener to set the opener travel limit, close travel limit, and the open/close force.